We have put together a tremendous archive of information and how to's for the new Sky Hub SR101 - Our thanks go out to all those involved. What does the Sky Hub look like? What size is the Sky Hub SR101? When is the Sky Hub SR101 released? How much does the Sky Hub SR101 cost? There are 2 LEDs on the back. The orange one indicates that something is connected. The green one flashes to indicate traffic. When I order one, what does it come with? Does it have IP address reservation? How do I configure the LAN IP side of things? Does it support Dynamic DNS? How do I change the password to access the Hub? Can I block specific websites etc? How do I backup my Hub's settings? Can the Hub be used on ADSL and Fibre? Does the Hub support DMZ? How do I set up port forwarding on the Sky Hub SR101? What do the LEDs look like? Just a short video to demonstrate some of what the new Sky Hub SR101 does. The Sky+ HD LED Blinks when you download load content using the Anytime+/On Demand section of the EPG. Does the Sky Hub support WPS and where can I find the PIN? Yes, the button for WPS is on the front of the new Hub and the PIN is printed on the label at the back of the Hub. WPS is enabled by default. Can I change The Wireless Settings On The Hub? Yes, as per usual, we have a tutorial for that. How do I get the username and password from the SR101? Anything else you need to know about the Hub, ask away! Last edited by NewsreadeR; 29-11-12 at 02:51 PM. I'm confused as to why there is a PIN on the back of the box with a WPS button on the front. It leads me to believe that if you press the button on the front of the router, it triggers something called Push-button connect (PBC) which DOES NOT require the PIN to be entered. Could you confirm this is the case? I assume the PIN on the back would be for external registrar WPS, where you don't need to press the button first, and you can just type that PIN into a computer and have it exchange the key. Any chance you could confirm those assumptions? Some WiFi N devices use the PIN to connect. Others use a WPS button. If your device insists on using the PIN then you can use this on the Sky Hub. I'm interested in this from the security research point of view. If you don't have to press the WPS button in 100% of cases, and WPS is enabled by default, if they haven't build a good lockdown system it's a pretty big security risk. Is the Sky Hub SR101 actually being offered for sale now to existing customers? I don't see it listed on the Sky site. As from 18th October apparently. 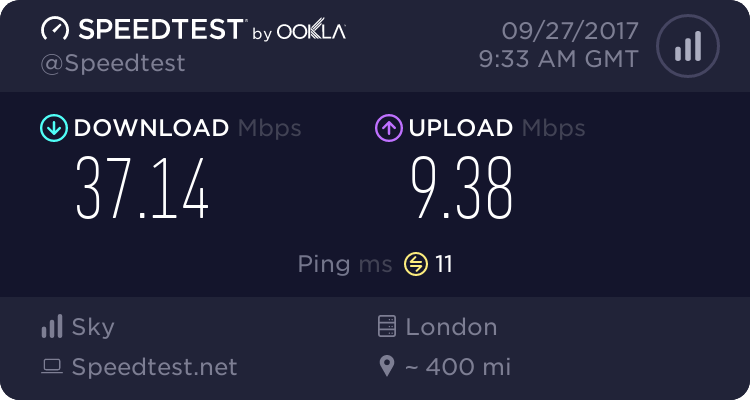 Sky has introduced a system where by if you get the PIN wrong some many time, you can't use is for several minutes, unless you power cycle the router. This will hopefully discourage someone from trying to hack the router by guessing the PIN. From a purely cosmetic point, it's certainly hugely more appealing than the 2504N. Have to say, having only got my 2504N last week, I'm hugely disappointed/annoyed that if i want one of these I'll now need to fork out over £40 for one. Hmm. If this had had Gigabit Ethernet, I'd have been tempted to get one to replace my WiFi N Sagem. They should have put at least 6 Ethernet ports on it, now that so much new stuff needs connecting.